Monogram Pendant Diameter : 5/8 Inch (1.6 cm). Offer 10K or 14K Solid Gold Option.- 10K or 14K Solid Gold Option. *Premium high end quality solid 10kt or 14kt yellow/white gold 3 initial monogram pendant necklace, chain comes from 15 ~ 20 inch solid yellow or white gold 14kt 1.0 mm Rolo chain. *All my personalized jewelry made in Los Angeles CA USA (hallmark on back of the item). *This item made and ship within 1 business day from Los Angeles CA 90014. *Offer 1 year free warranty and from the date of you receive, you have 14 days to evaluate your purchase and if you are not 100% satisfied for any reason, simply return it for Full Refund or exchange, no restocking fee even its personalized item. 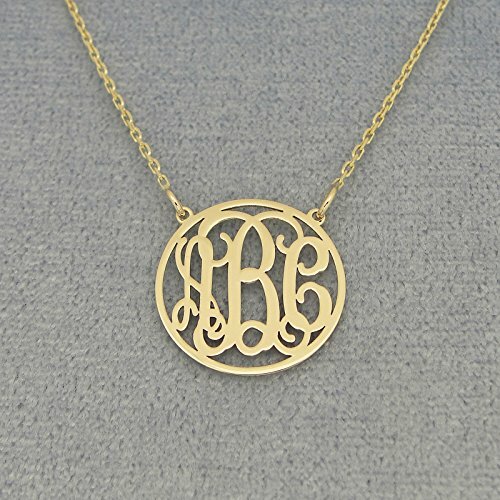 *These monogram jewelry typically structured with the Last Name as the large initial in the Center, the Left Initial is the First Name, and the Right Initial is the Middle Name.